5 Weeks have passed and with that we have reached Chapter 20! If I could say in what these 5 chapters have in common, it is that the focus is on the “Other Teams” ergo the ones who doesn´t have Chrono, Shion, Tokoha or Onimaru in them! Still they where worth it; but lets check it out! This Chapter is basically the comeback for Team Neo Nippon, since now the fight will be between Kazuma Shouji against Makoto Asada. While the fight was Ok, in truth what the people will remember even more is the information regarding this team, so I will just say that Makoto won against Shouji. Now the important part it is that the story of this team, Neo Nippon and the connection between Arata, Makoto and Noah, where one see how Arata started searching for his team mates by fighting any person until he could feel the connection (which appeared whenever he loses); the fights inside the team, especially since Makoto though that he only wanted it in his team because he used the same clan as Shin –from the original Nippon team- still that isn´t the case at all and then Noah came who put them the objective of not being only the best in the world; but the Universe! I have to give mad props to the writers and designers for how the design of these characters and how well was put the story together, heck it even felt like a recap of an anime previous season! At the same time, their designs are superb; I mean if I didn´t know anything about Vangaurd and you just showed it me these characters, I would have guessed they were the main characters! Finally… Yeah, this chapter, and team, was a big “Fujoushi bait” since we got the hot-blooded character (Arata) who screams to (other men) things like “I have fallen for you!” or “You are my destined partner!”; we have the calculating and cool character (Makoto) who has a true bond with Arata that it even might look a little more than friends… Like Best friends of course; and finally we have Noah, who is basically a “Trap” character (someone who looks the other genre) and acts a little childish or jolly. Also other teams might as well touches… “other genres”; but I will talk about that later in the article. Now to the next one! This chapter was basically incredible! Except maybe for one thing, and it is the result of the fight. Still, this chapter was a fight between Tokoha of “Jaime Flowers” Team against Taiyou from “Striders”. The fight, As I said was excellent and it showed the good things that both Great Nature and Gold Paladins Clans have to offer! In the end Taiyou wins, and he wins in a good way; but I would have preferred that Tokoha would have won. This Chapter was dedicated more to Satoru Enishi, who basically had to fight against Kamui in order to rescue Tokoha from the penalty area… and Kumi who lost in the middle of the chapter, so everything depends on him now! The Fight was quite good I have to say, and we got to know a little more about Satoru Enishi and what was of his life between Stride Gate Season and this one, from his desire for Redemption and to want to spread the happiness that Vangaurd might bring to the people, also how Jaime, Kumi and Tokoha has embraced him as one of them and a friend; at the same time Jaime has asked him to watch for Tokoha since it seems that in truth she is still depressed for all the deal with Miguel´s Death. At the same time Satoru Enishi doesn´t have any true goal in this tournament… But he has come to the conclusion that for the sake of his teammates and friends he will fight and defend them! In the end, obviously, Enishi wins and both Kumi and Tokoha gets rescued! This Chapter centers more in the Character of Rin, who is pissed at Tokoha and Shion the first one because it is her rival AND her eyes aren´t aimed at her; but to her own intentions right now. With Shion she is just pissed at him and be his Puppet. Then Shion decides to settle this with a Cardfight! Too much dismay to Hayao. The fight was amazing to just to put it short, quite well paced and with a lot of amazing moments. In the end Shion wins; but he gives to Rin something Excitement… A escape to her boredom, he will become in the door she needs to escape such thing, and the only place where other fighters like Shion are is in this Under-20 Tournament. At the same time Hayao got a crush to Rin since she looked so beautiful in this fight! 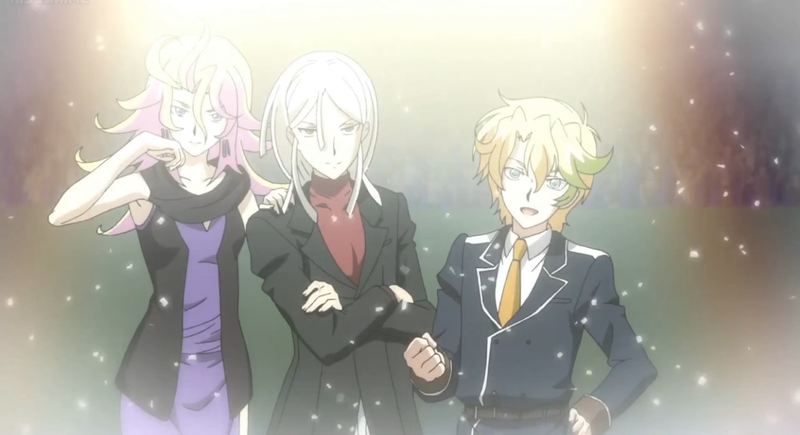 At the same time we get to know that Shion don´t truly care for the Under-20… Or even the Cardfight!! Club; but he cares to prove to Chrono, Tokoha, Himself and Kazumi Onimaru that he is the strongest! In the end Rin decides to stay, if it wasn´t obvious. The Chapter is centered more in the team of Rummy Labyrinth with Saya, AKA the Idol team. While Saya is in here for fun; for Rummy Labyrinth (Luna and Am) are in here in order to some way to atone for their sins (See Stride Gate Arc). In any case Am is able to see that Shio is in there, and she remembered when she ruined his life and the fight both of them have, and still… In the end, when everything was said and done, Shion decided to help her in the treatment of her Parents. In any case it is time for the action! And Hayao is going to face Am! Needless to say Hayao is a big fan of Am; but he won´t go easy on her! The Fight is good enough, but I have seen better, still it got the point cross and we sought a lot of great plays and strategies, like Hayao avoiding Am´s strategy. Still, in the end, Am is able to win against Hayao, who got a commemorative strap at the very least! After that we sought some bonding between the Rummy Labyrinth and Jaime Flowers team, mostly because Tokoha knows and is friends with the Idol team! Neo Nippon: They look more like a Kids Shounen anime characters (their design is quite good tough). Rummy labyrinth with Saya: seems in some way a little like the “Cute Girls doing Cute things” in truth. Heaven and Hell: a Romantic Comedy or Harem anime, since how this team how come to be is still a mystery; but not the team mechanic I will spoil why is that: Kamui loves Emi; but Emi just looks at him as a friend, at the same time Nagisa (Kamui´s Childhood friend) is in love with him and to make things worse Emi believes that Kamui and Nagisa are dating or at the very least likes each other. Now this is somewhat interesting since it make us see with other eyes the series as a whole and it is an interesting mechanic since for what I can see there will be chapters dedicated to these teams making us see them and getting more interested in them, to not to be other face that the “4 main teams” will have to beat; but ones that we can recognize and even sympathy’s with them. In other things, I would really like some more chapters about Tokoha since it seems that her story arc is the most interesting as of right now, similar in how Shion´s story arc was the best in the Girs Crisis arc, so yeah, I would like to see more of Tokoha right now!